I was intimidated by this technique until I found your blog and these instructions. I am now knitting my first entrelac project and it is going really well. Thank you for sharing your knowledge and skills! I would love to see how your project is coming along! Feel free to hop over to my facebook page and share some pictures. Thank you for this simple example of a scary technique. I'm a left handed knitter and could easily follow along. I'd been admiring a kit for a baby blanket that used this technique, but didn't like the company's reputation for complex and mistake riddled patterns. My mother-in-law was also interested in this technique and not internet savy. So your PDF is perfect for her. Thanks again. Great tutorial! I also loved the crow cawing in the background.. lovely.. I am starting a scarf so am excited that I found a tutorial that I understand! Thanks again! I am "trying" to knit a baby blanket using this pattern and having a terrible time. The first triangle is perfect but when I do the second one it seems to be attached at the bottom to what I just knitted???? I obviously am doing something wrong and have torn this out 3 times. Why doesn't the second triangle look like the first? I tried making several more but they were all curled and didn't even resemble a triangle. Would really appreciate hearing from you. I looked at your video several times and doing exactly what you show but it is not working? I need help. The triangles are going to curl and look funny until the first tier of rectangles and side triangles have been worked. Do you have to do squares in multiples of 5? No the squares don't have to be in 5's. You can make them any number of stitches you like. squares or triangle. Suppose I want to knit a daisy stitch with ten stitches. It says CO 4 plus 2 (both edges), how can I come up with ten stitches to make a beautiful daisy pattern? Do I have to knit first row in RS then do the daisy? I'm not confused but trying to figure how I can do that. Comments and feedback are welcome here. Thx! 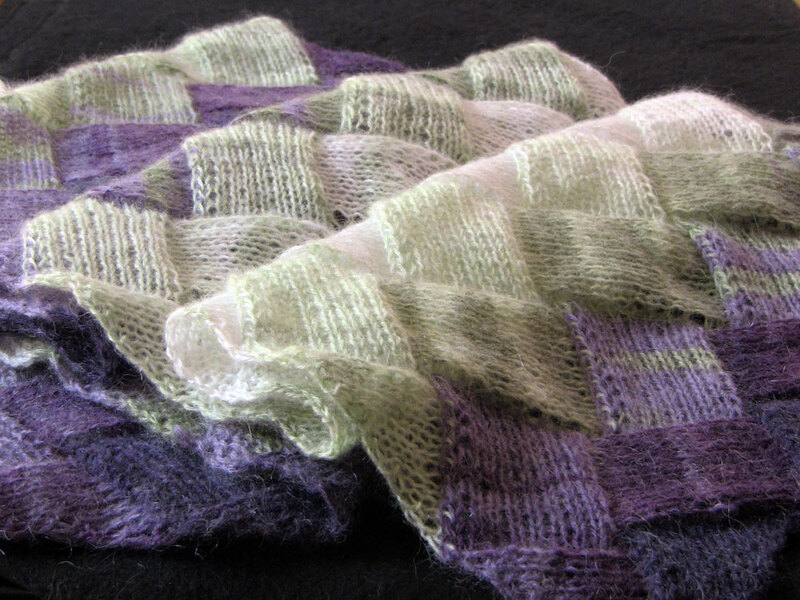 You can incorporate any stitch pattern in an entrelac rectangle. You just use the multiple for whatever your stitch calls for. If your stitch pattern starts on a wrong side, you can begin working it on the wrong side of your entrelac panel. If the stitch pattern starts on a right side, then start working it on the right side of the entrelac. That is the way I find it easiest, I am sure others have their own way. I always wanted to try this entrelac knitting technique but was scared thinking it to be "not my cup of tea" kind but your beautiful tutorial changed that today. I am looking forward to knitting my first entrelac scarf very soon. It was just some small skeins that came with a magazine I bought. Thanks for the tutorial and your videos. They are very helpful. I am looking for a pattern for fingerless gloves or fingerless mittens. Do you or some body else know where I can find this? To be made with quite thin yarn. Ravelry is probably the best place to look for a pattern, and you can filter the results by yarn weight. I want to knit my first entrelac project. Your tutorials seem very clear so I will give it a try. I see that the cast on is a multiple of 10. I want to use a worsted weight yarn in my stash plus I don't want my scarf to be as wide. I saw another entrelac pattern using worsted, multiples of 8 (24 cast on). Would your pattern work if I cast on say 20 or 30 instead of 40? thanks. Yes, you can make your rectangles any number of stitches you like.